Soundking Group Europe has announced the appointment of Simon Alexander to the position of UK sales manager for Carlsbro and Studiomaster following the reinstatement of its UK/Eire distribution of the brands from its Luton HQ. 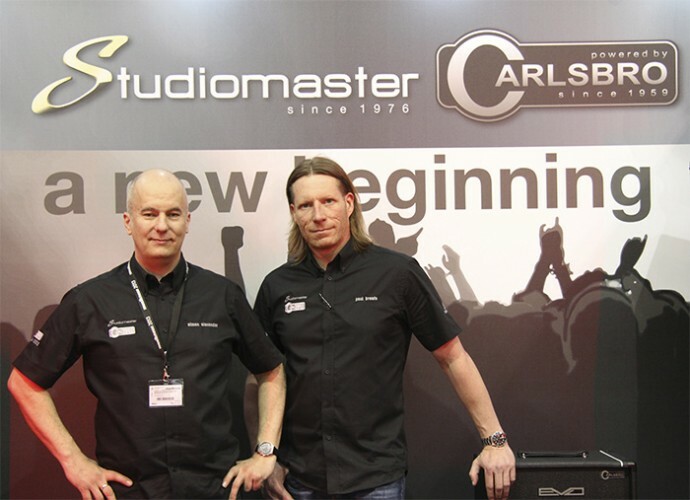 The appointment of Alexander, formerly area sales manager for UK central region with Marshall Amplification for four years, was confirmed at Musikmesse 2013, where he joined the expanding sales and marketing team for the two classic UK MI and pro-audio sector brands. While at Marshall Amplification he was responsible for increasing sales for the brand across the central UK region, doubling the turnover with several key accounts in the first year alone. He left Marshall in 2011 to join Freestone Creative Marketing Solutions as senior account manager, looking after a number of key MI sector clients, including Korg UK, Vox Amplification, Marshall Amplification, Line 6 and Yamaha. In picture: UK area sales manager, Simon Alexander and international business development, sales and marketing director, Paul Brewis on the Musikmesse stand.